Until recently St Helena was one of only two ocean-going vessels in the world still to carry the venerable title of Royal Mail Ship, held in the past by so many famous British passenger liners. The Royal Mail Ship St Helena was built in Aberdeen and launched in 1989 specifically to supply the island of St Helena, a British Overseas Territory deep in the tropical South Atlantic. Her regular route included stops at Cape Town and Ascension Island in the mid Atlantic. She was British registered, 6,767 gross tonnes and has berths for a maximum of 156 passengers plus 56 officers and crew. She now flies the flag of St Kitts and Nevis. 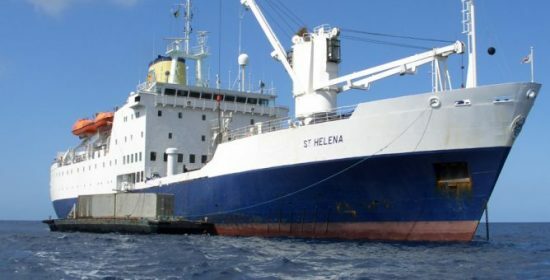 In addition to carrying passengers she was a lifeline for residents on her island namesake as she carries all their goods and supplies to St Helena. From wind turbines to automotive parts; sheep, goats, and Christmas turkeys to furniture, food and paint, everything has to be carried by ship to the island. She was retired from service once the ill fated and long awaited airport on the island had been finally declared safe to use. Renamed MNG Tahiti, the 340-foot ship was then sold to MNG Maritime who planned to use her as a floating armoury packed with automatic weapons, bullet-proof jackets and night vision goggles, all stored for maritime security operatives acting as guards onboard passing vessels navigating stretches of water lurking with pirates. Clearly that idea did not last long and the ship, now called St Helena is in Portland under the management of hull based; Wilson Yacht Management. The new owners; St Helena LLP registered in St Helier Jersey are said to have close connections with the Formula 1 racing industry.